Ed was recently interviewed on The Arch, an architecture and design podcast in association with Form Magazine. The 40-minute interview covers Ed’s background, core design philosophy, and goes in-depth into several recent projects. Thanks very much to host Jeff Urdank and Form Magazine for a great conversation. The podcast can be accessed from Form, Soundcloud, or iTunes. This week, Edward Ogosta Architecture was included as one of 15 top Los Angeles offices on two leading design websites—ArchDaily and Dezeen. Both sites provide a glimpse into LA architecture firms with images by photographer Mark Goodwin. EOA is in good company, being featured alongside such veteran firms as Morphosis, Michael Maltzan Architecture, and Brooks+Scarpa. We’re amazed how far our little addition project has come, and how it’s resonated with people as a smart way to extend the life of an aging home. Living in the Desert, a new book by Phaidon Press, arrived in the mail today and features a spread on our Four Eyes House. The book “showcases 50 works of residential architecture from across the last few decades, each with a unique connection to the desert in which it's situated from the US, Europe, Asia, Australia and beyond.” A review of the book, for which we contributed our thoughts on desert living, can be found on Artsy.net. We’re honored to see our work included in such a beautiful monograph, alongside works by architects Rick Joy, Johnston Marklee, and Olson Kundig. In anticipation of the AIA Los Angeles Design Awards on October 30th, the AIALA recently posed five questions to Ed Ogosta, this year’s Emerging Practice Presidential Honoree. The full interview can be read here. We’re very honored for the recognition, and look forward to the ceremony! The AIA California Council has selected our Rear Window House as one of just ten honorees in the state for their 2018 Residential Architecture Award. 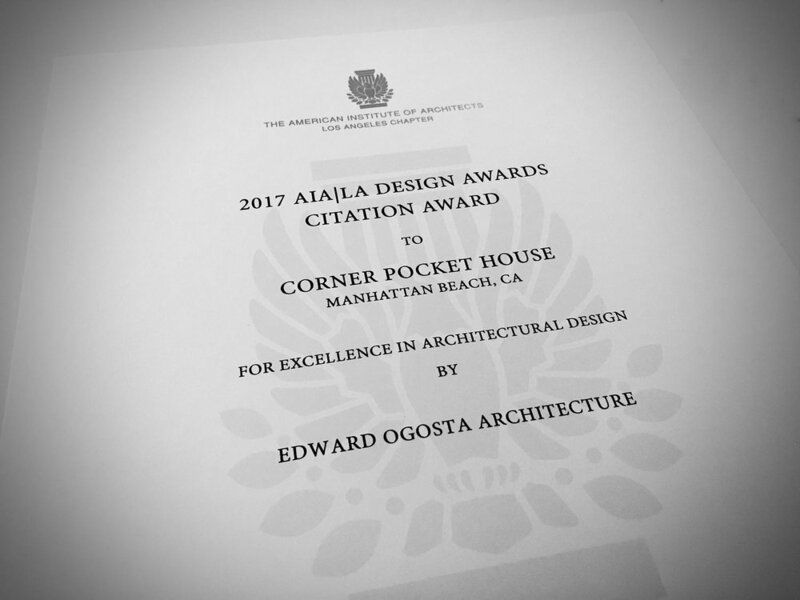 This marks a huge achievement for us; the project is now a design award triple winner, at the local, state, and national levels of the American Institute of Architects.. Only a very tiny minority of projects ever achieve such a “triple crown” recognition from all chapter levels of the organization. We are incredibly humbled by the realization that, with this honor, our little project now has basically no AIA awards left to win! 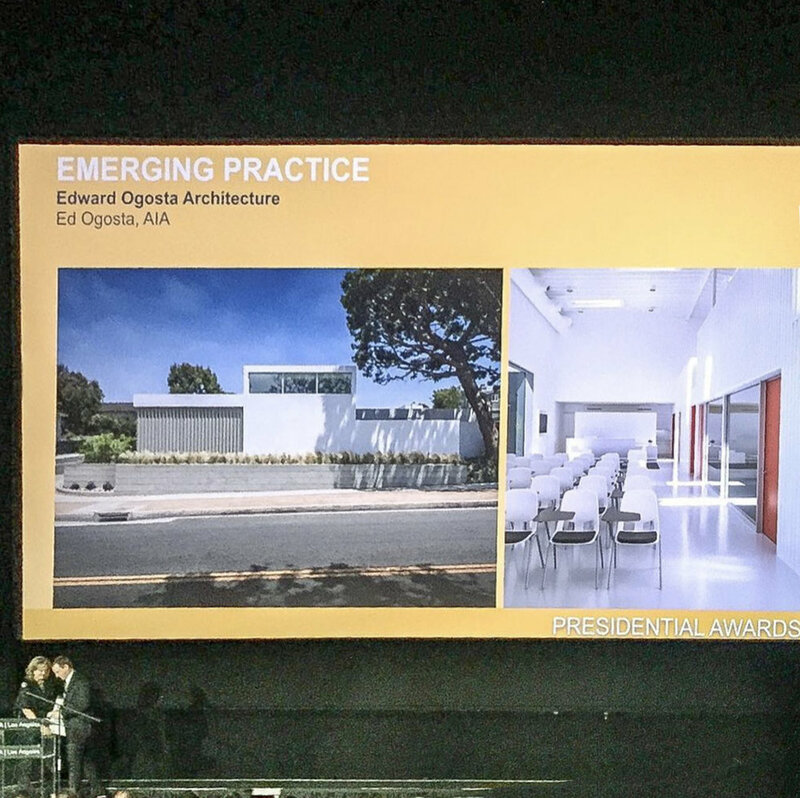 Thrilled to announce that the AIA Los Angeles has selected Edward Ogosta Architecture for the 2018 Presidential Honoree Emerging Practice Award. Selected by the AIALA Board of Directors, this honor goes to a single Los Angeles office in existence for seven years or less, and recognizes a significant body of high-quality, realized architecture. An awards ceremony will be held at the Egyptian Theater on October 30th. We are incredibly grateful to the AIA|LA for this award; it's a wonderful culmination to all our effort for the last few years! 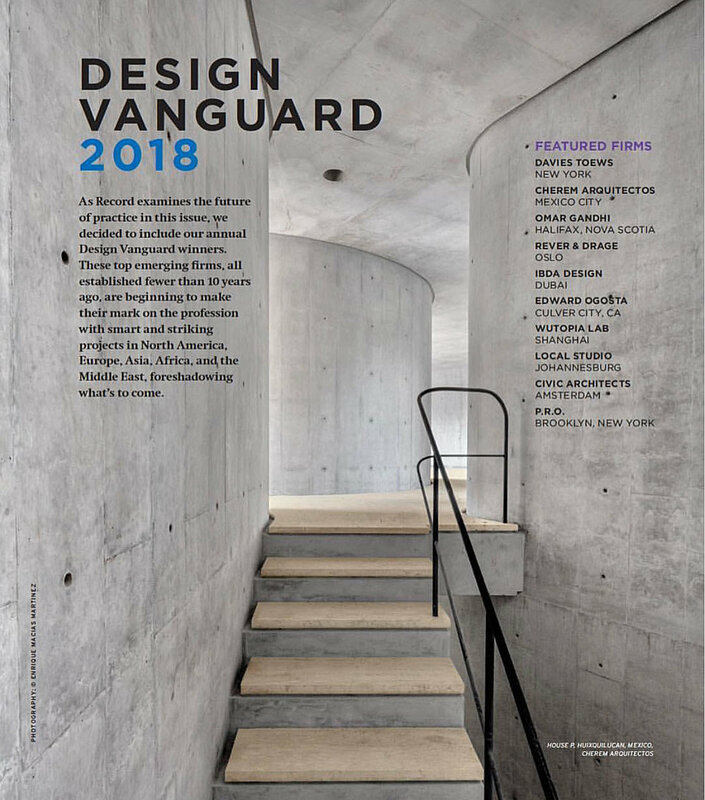 Edward Ogosta Architecture is immensely honored to be selected as a 2018 Design Vanguard winner from Architectural Record magazine. Ours was one of ten emerging firms in the world selected for this award, with only three being from the United States. Record profiled EOA in their June 2018 issue, highlighting our commitment to an architecture of experiential depth and amplified atmosphere. To date this is the highest accolade our office has yet received; we are incredibly gratified by this recognition. The full article can be found here. Very pleased to announce that our Rear Window House has won a Small Project Award from the national AIA. Ours was one of eleven projects chosen from around the country, all with modest budgets. The jury commented the project is "a beautiful and precise addition which gives new meaning to the historic bungalow." We're very honored our little project has merited this recognition. An awards event will be held at the AIA National Convention in New York on June 21st. Our Corner Pocket House has received an American Architecture Award from the Chicago Athenaeum Museum of Architecture and Design. 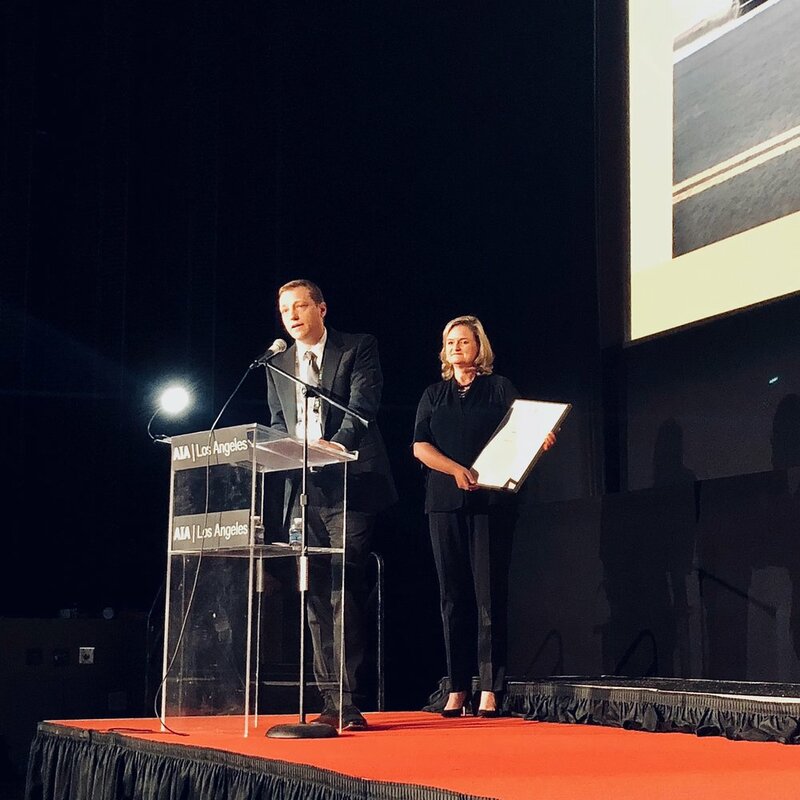 This award is considered "the nation’s highest public awards given by a non-commercial, non-trade affiliated, public arts, culture and educational institution." Ed will be attending the awards gala at the Alvar Aalto-designed Edgar Kaufmann Conference Room at The Institute of International Education in New York later this month. Other winners this year include Tadao Ando, Olson Kundig, and Foster & Partners, so we're honored to be in such good company! After several months of production, we're excited to share a short film showing life in our Rear Window House in Culver City. Created by the talented filmmaker Reuben Hertzl at Groundmaking, the video goes in-depth to highlight the experiential qualities and details of the house, giving a glimpse of the house's character in different weather conditions and times of day. Our aim was three minutes of thoughtful quiet; please view below (fullscreen recommended!). Our Rear Window House in Culver City has been selected for Dwell magazine's LA Home Tours! Please join us on Sunday April 8th, 9AM-4PM for a visit. Ed will also be speaking about the project on Wednesday April 4th, 6-9PM at Dwell’s Meet the Architects Night at the PDC. Tickets can be purchased here. Our Rear Window House got a little feature in California Home & Design, in an article about the project's creative use of asphalt shingles as an inexpensive continuous cladding for both roof and exterior walls. Check it out here. We are incredibly honored to receive this award, which is given every two years, and thank the jury and AIA LB|SB for the recognition! Earlier this summer we completed construction of our Corner Pocket House in Manhattan Beach. The project is a complete modernization and major addition to a 1950's bungalow. Photos and documentation of the project are now live, here.